As a college graduate, former Purdue Professor Charles Alton Ellis was among the engineers who collaborated on the construction of the Golden Gate Bridge. Ellis was not credited for the bridge until recently, despite helping design, in his own words, "every nut and bolt on the darn thing." 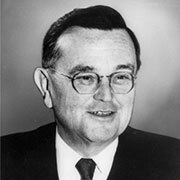 Ellis served at Purdue as a professor of civil engineering from 1934-46. Leslie Geddes was Showalter Distinguished Professor Emeritus of Biomedical Engineering. In 2004, Geddes received Purdue's Outstanding Commercialization Award to recognize his 30 patents, many now licensed by Indiana companies. Patents and technologies emerging from Geddes' laboratory have generated more than $15 million in royalties for Purdue. He received the 2006 National Medal of Technology from President George W. Bush in a White House ceremony in 2007. The award is the nation's highest honor for technological innovation. Among the accomplishments during his career spanning 50-plus years were innovations ranging from burn treatments to miniature defibrillators, from ligament repair to tiny blood pressure monitors for premature infants. Geddes died in 2009 at the age of 88. 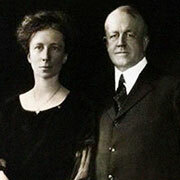 Frank and Lillian Gilbreth were renowned as "the Father and Mother of Modern Management," and their motion study work continues to interest and attract researchers. The Gilbreths' research introduced using photography and motion pictures to study and helped improve the efficiency of industrial workers and minimize worker fatigue. In 1935, Lillian Gilbreth became the first female professor in the College of Engineering. She also accepted the role of consultant for careers for women and helped establish a time and motion study laboratory at Purdue. She retired from the University in 1948. The couple also raised 12 children together, and the story of their family life has been recounted in numerous journal articles, books and films, notably "Cheaper by the Dozen." 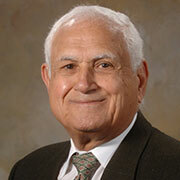 Adel Halasa is credited with developing the tire tread polymers for the Goodyear Aquatred tire, released in 1991. 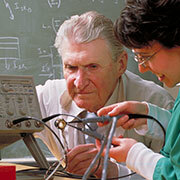 He received his doctorate in chemistry from Purdue in 1964. Halasa has more than 250 patents and is a 1997 recipient of the Charles Goodyear Medal given by the American Chemical Society, Rubber Division, to members who "have exhibited exceptional technical competence by making significant and repeated contributions to rubber technology." In 1998, 2000 and 2005 he was named Goodyear Inventor of the Year. He also received the 2003 Distinguished Science Alumni Award from Purdue. Halasa also established the first facilities in Kuwait for the use of sulfur in asphalt road applications. In 1977, Brian Lamb, a Purdue alumnus, founded C-SPAN — Cable-Satellite Public Affairs Network. The network's initial telecasts of the U.S. House of Representatives commenced in 1979, and today there are three C-SPAN networks offering around-the-clock coverage of the political process. Lamb earned his bachelor's degree in speech in 1963 and received an honorary doctorate from Purdue in 1986. In 2007, he received the Presidential Medal of Freedom and was named Washingtonian of the Year. In 2003, he was awarded the Freedom of Speech Award, the National Humanities Medal and the Harry S. Truman Good Neighbor Award. In 1987, Lamb designated Purdue as the original home of the C-SPAN Archives, which records, indexes and archives all C-SPAN programming for historical, educational and research uses. Now located in the Purdue Research Park and operated and entirely funded by C-SPAN, the archives records, stores and makes accessible every C-SPAN program aired since 1987, totaling more than 160,000 hours. 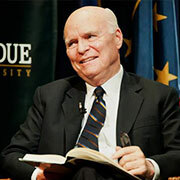 In 2011, Purdue named the Brian Lamb School of Communication after the Lafayette, Indiana, native. Before C-SPAN, Lamb was publisher of The Media Report, Washington bureau chief for CableVision magazine, freelance reporter for United Press International Audio and public affairs officer in the Navy for the Pentagon. Lamb also served as a military social aide for the White House under President Lyndon B. Johnson and as the media and congressional relations director for the Office of Telecommunications Policy during the Richard Nixon administration. An 1884 graduate in one of Purdue's first agriculture classes, Elwood Mead was an irrigation expert who provided his expertise in Indiana and Wyoming as well as overseas in Australia, Palestine and South Africa. 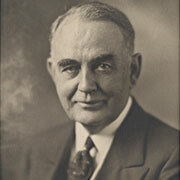 In 1924, he was named commissioner of the Bureau of Reclamation of the U.S. Department of Interior. He went on to become the chief engineer behind the construction of the Hoover Dam. The dam's reservoir — the largest man-made reservoir — bears his name, Lake Mead. Purdue graduate Charles Pankow is credited with helping develop the concrete building frame that is exceedingly resistant to earthquakes. The Precast Hybrid Moment Frame was a result of the joint efforts of Charles Pankow Builders Ltd., and others. It utilized the precast concrete in providing a seismic framing system that outperforms structural steel. The system is well-known for its use in The Paramount, a 40-story apartment tower in San Francisco, among other structures. Pankow came to Purdue in 1941 and — after stepping away to serve in WWII — graduated with a civil engineering degree in 1947. After 15 years of working at construction companies, he established his namesake company in 1947. The company is responsible for more than 200 buildings since then. 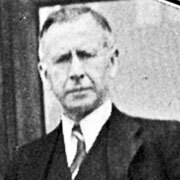 Through his company, he established a number of innovations in concrete forming technology and developed new ways of approaching the construction of buildings. David Ross, an inventor with some 88 patents, is a Purdue alumnus who went on to become a trustee and noted University benefactor. Born in 1870, Ross graduated from Purdue in 1893 with a degree in mechanical engineering. 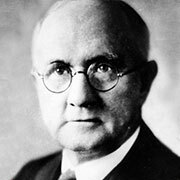 He went back home to the Brookston area upon graduation, but his creation of new devices for the young automobile industry caught the attention of car manufacturers, and he went on to form the Ross Gear and Tool Co.
Ross would return to Purdue, serving first on an alumni committee, and later on the University's Board of Trustees. He played a significant role in raising funds for the Purdue Memorial Union and was instrumental in developing Ross-Ade Stadium, faculty pensions and the Purdue University Airport. He also was behind the creation of the Purdue Research Foundation. Though Ross died in 1943, his legacy as a Purdue benefactor is forever sealed. He is buried on campus on Slayter Hill. A one-time tuba player in Purdue University's "All-American" Marching Band is credited with the development of Fiberglas, the world's first commercial fiberglass product. R. Games Slayter, an Indiana native, graduated from Purdue with a bachelor's degree in chemical engineering in 1921. In the early part of his career, he worked at Owens-Illinois Glass Co. in Toledo, Ohio. It was there that he first created the coarse fibers that led to the production of Fiberglas. Slayter continued his work in 1938 as vice president of research and development, refining Fiberglas' production process to make it financially viable. He remained with the company, which merged to become Owens-Corning Fiberglas Corp., amassing more than 90 patents in fiberglass technology before retiring in the 1960s. 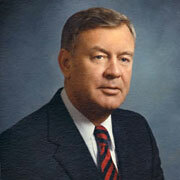 Slayter even served as a consultant for NASA before the end of his career. He died five days after attending the first concert at his namesake Slayter Center in October 1964.